These libraries were all received prior to the FGSC move in 2004 and are now considered ARCHIVAL. They may be available, but no guarantee as to titre or genome representation is made. The BAC and fosmid libraries are being considered for de-accession. Please contact the FGSC if you have a compelling reason to see these resources maintained into the future. We have received the fosmid library used at the Broad Institute for the F. graminearum genome. Individual clones are available as living stabs. Additionally, we have the 21 plate BAC library used at the Broad. Individual clones are available as living stabs. The libraries are distributed as an aliquot of an amplified cosmid pool on Dry Ice. 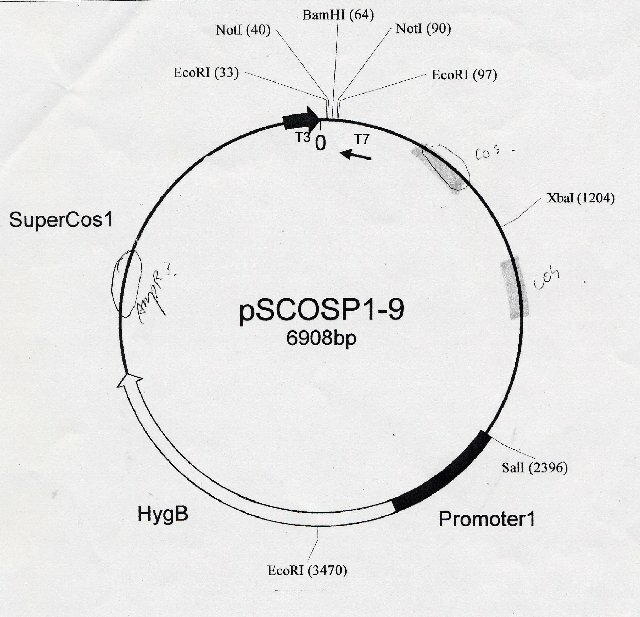 They are in the vector pCosP1-9 which encodes Hygromycin resistance. It is described in Mol Gen Genet 24895-102. Each sample has 1 ml of 1x 10 8cfu/ml. The host is XL1-Blue MR. The original libraries contained 10,000 (R5317 and T0348) or 70,000 (M3126) colonies. Inserts range from 20-40 kb with the average insert size 35 kb. The library was constructed using Sau3AI digested DNA ligated into vector and packages with Gigapack III XL (Stratagene). They must be sent by Fed Ex and special arrangements must be made to send them to overseas destinations. Both cDNA libraries were constructed using RNA from strain PH-1 (FGSC # 9075) with Stratagene's Uni-Zap system. The two libraries are the carbon-starved library and the nitrogen-starved library. They were each amplified at the FGSC. They are described in Trail, F., Xu, J. -R., San Miguel, P., Halgren, R. G., and Kistler, H. C. 2003. Analysis of Expressed Sequence Tags from Gibberella zeae (anamorph Fusarium graminearum). Fungal Genetics and Biology. 38: 187-197. Each library aliquot would be a small sample suitable for screening or amplification.